More than 200 persons were killed and 350 others injured today when runaway rail wagons loaded with sulphur, petrol and fertiliser derailed and exploded in northeast Iran, the state news agency IRNA reported. A frame grab taken from Iranian television shows a destroyed train wagon near the Iranian city of Nishapur on Wednesday. 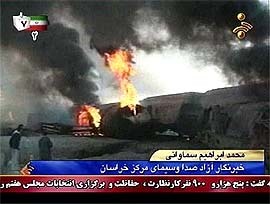 Over 200 persons were killed when runaway fuel wagons exploded in northeast Iran. Pakistan would reject any move to bring in foreign inspectors to monitor its nuclear weapons or civil nuclear facilities, President Pervez Musharraf said in an interview in today’s Financial Times newspaper. A Sri Lankan accused of being the chief financial officer for an international nuclear black market sat on the board of a company owned by the Malaysian Prime Minister’s only son, according to documents obtained by The Associated Press. Emphasising the need for greater cooperation between India, Israel and the USA, Israeli Deputy Prime Minister Ehud Olmert has proposed the setting up of a “trilateral fund” to stimulate, promote and support industrial research and development for mutual benefit. The India-China Eminent Persons’ Group held talks here today to build upon the recent positive momentum in bilateral ties. The Indian component of the group at the two-day talks is led by former Minister of State for External Affairs R L Bhatia while the Chinese side by former Vice- Foreign Minister Liu Shuqing. 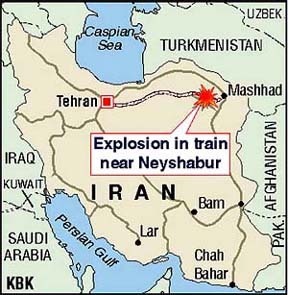 The massive blast occurred at Khayyam station, near the town of Neyshabour and was heard in the provincial capital of Mashhad, some 75 km away, IRNA said. Local officials said the rail wagons, which were parked in a nearby station, began rolling away in the early hours of the morning. The wagons then derailed and a fire began, drawing firefighters and curious onlookers to the scene. Musharraf’s comments follow the confession earlier in February by Abdul Qadeer Khan, father of Pakistan’s nuclear weapons programme, that he sold nuclear secrets to Libya, Iran and North Korea. 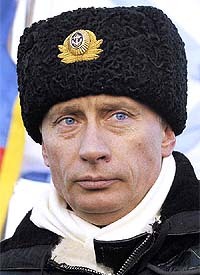 The news has heightened the USA fears that nuclear arms may fall into the hands of its enemies. Last week US President George W. Bush proposed that only states that sign a protocol to the nuclear Non-Proliferation Treaty to permit unannounced UN nuclear inspections be allowed to import equipment for civil nuclear programmes. Musharraf also said Pakistan would not freeze its nuclear weapons programme. Earlier yesterday Pakistan agreed a framework for peace talks with its neighbour and nuclear-armed rival India, in which nuclear security was one of the top issues. Musharraf said that Khan acted alone in selling nuclear secrets to other countries and that Islamabad’s nuclear programme was not under the aegis of the military. Musharraf’s comments came less than two weeks after he pardoned Khan, following the scientist’s public confession that he had passed on nuclear technology to other countries - believed to be Iran, Libya and North Korea. 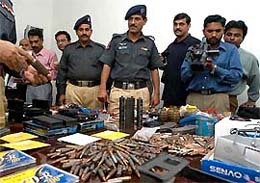 The connection indicates that alleged senior members of the network established by Abdul Qadeer Khan, the father of Pakistan’s nuclear bomb, were able to woo partners in the highest levels of society. In the Malaysian case, the partners said they had no idea deals were being made to fashion parts that could be used to make nuclear weapons. The documents, obtained by AP via searches of publicly accessible files, reveal a paper trail through privately held and publicly listed companies that outlines ties between the Prime Minister’s son, Kamaluddin Abdullah, and the Sri Lankan, Buhary Syed Abu Tahir, as well as his Malaysian wife. The documents show that the men were top executives at Kaspadu Sdn Bhd when Tahir negotiated a deal for a company linked to Kaspadu, Scomi Precision Engineering, to build components that Western intelligence agencies allege were for use in Libya’s nuclear programme. The three countries need to “work out coalitions” and to formulate plans to “build upon the advantages in the hi-tech sector”, he said at a trilateral conference to strengthen the ‘strategic triad’ yesterday. The USA and Israel already have a binational fund, commonly referred to as BIRD Foundation, and Israel had earlier suggested setting up a similar fund to boost Indo-Israeli cooperation during the visit of Commerce and Industry Minister Arun Jaitley to Israel last month. Describing New Delhi as a “formidable power” and its relations with Israel “as one of the greatest assets”, Olmert said “India was high on Israel’s priority” and is an “emerging skilled manpower centre dominating the high-tech”. 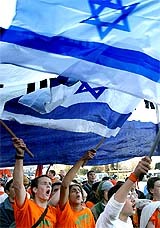 With Israel and the USA sharing similar expertise, “a constructive cooperation between the three countries would work in the interest of each one of us”, he said at the conference jointly organised by Washington based think tank Jewish Institute for National Security Affairs (JINSA) and The International Policy Institute for Counter-Terrorism. The India-China Eminent Persons’ Group held talks here today to build upon the recent positive momentum in bilateral ties. The Indian component of the group at the two-day talks is led by former Minister of State for External Affairs R L Bhatia while the Chinese side by former Vice- Foreign Minister Liu Shuqing. A campaign by blacklisted reformist candidates to shun Friday’s Iranian parliamentary election gained an illustrious endorsement when Nobel laureate Shirin Ebadi said she would not vote. Ebadi, whose surprise choice for the 2003 peace prize shone a global spotlight on the struggle for human rights in the Islamic republic, said she would not cast a ballot because of the mass disqualification of reformist candidates. South African officials have reported the discovery of a family of six isolated from the rest of the world for past 20 years. The family was found by chance at a farm in a remote rural area of the central Free State province of the country. The family has been removed to a hospital in the town of Welkom for rehabilitation. Four members of the family — aged 26, 22, 18 and 14 — have never had contact with the outside world. Their behaviour is animalistic and they can’t even communicate in an understandable language, officials said, adding that one of them walks on all fours, almost like a monkey. Their mother is also unable to speak in any language and they communicate with the father in sign language and noises. The oldest son is reported to have never slept inside their thatched home. A decision on the family’s future would be made once they had been assessed by the team of doctors, provincial health Minister Ouma Tsopo said. “They are in a traumatic state. Officials have had to wait until dark and the children were in the shack before they could move the family”, she said. 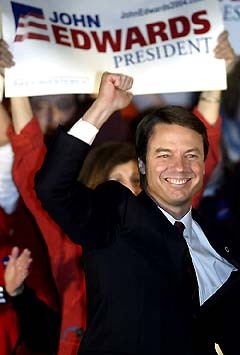 US Democratic presidential candidate Senator John Edwards celebrates during an election night rally in the Wisconsin presidential primary at Serb Hall in Milwaukee, Wisconsin on Tuesday. OSLO: Mullah Krekar, founder of a radical Kurdish Islamist group, Ansar al-Islam, was released from prison in Norway, two weeks ahead of the set expiry date for his temporary detention, his lawyer said. Krekar, who has lived in Norway since 1991, was temporarily detained in the beginning of January for four weeks as police investigated his possible involvement in the murders of Kurdish-Iraqi political rivals.